Welcome to the blog of Matthew James, author of “Only an atheist can help God save the world”! Hi there and welcome to the blog of Matthew James, author of ‘Only an atheist can help God save the world’! Now, if you’re here because you have been redirected from either Twitter or Reddit then I hope you will give me a chance to convince you to give both my blog and my satirical novel a go. Hopefully you’ll find something you like. My blog is entitled ‘Rambings’ and on it you’ll find articles about comics, movies, politics, and of course my novel, as well as the self-publishing process and Indie authors, of which I am one. Anyway, onwards! So, my novel asks the question of what does God do when he finds out the extent to which humanity is destroying the Earth? Well, He travels to Earth to talk to us and try to persuade us that we should stop what we are doing and save ourselves and our world. Unfortunately, Heaven has become a bureaucracy that He, due to His somewhat fiery temper, is no longer in charge of and now God must obtain permission from The Committee, run by His former voice, Metatron, to even come to Earth. And when He gets here He finds that the only person who can help Him is an atheist called Jeff. This is as much as I wish to say for I do not want to spoil anything. God was in a meeting. God was always in a meeting and these days they seemed to stretch to eternity. And God could tell you a thing or two about eternity. But these meetings were necessary. In the beginning it was just Him and He didn’t have to suffer meetings. But the Universe had continued to expand and God, even as all-powerful as He is, had needed help. So he’d created the angels and, for a time, they had all gotten on famously. The angels had carried out His will and pitched in with all of the necessary management tasks that continued to endlessly pile up. They had even helped Him to keep His temper when it all got a bit too much. Now, I’m an atheist and this book is very much written with a sense of fun and only a pinch of seriousness. I hope that it combines a little of The Hitchhikers Guide to the Galaxy with some of Good Omens and Kevin Smith’s Dogma thrown in. And thankfully that is what those who have read it have been telling me. My pen name is Matthew James, but this is not my real name, for when you publish a book that satirises religion, even relatively gently, it seems a good idea to maintain some distance between yourself and your work. So if you do like what you have read and you buy my book and you enjoy it then let me know on Twitter or Reddit or at the email address below. I’d love to hear from you! I’d also love it if you told your friends and family about the book and helped me to spread the word for that is the only way someone like me can succeed. Cheers! 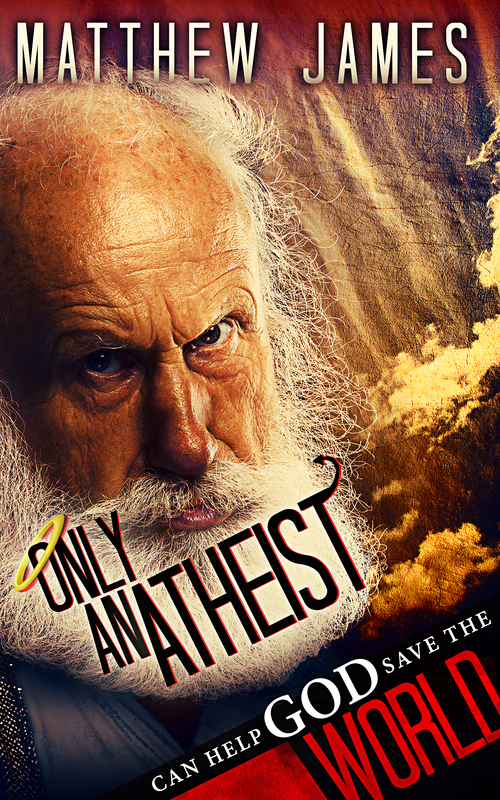 Update: ‘Only an atheist can help God save the world’ now has THIRTEEN reader reviews with an average of 4.5 stars and is available from all electronic retailers including Amazon UK here: http://tinyurl.com/pgjd68z. The sequel, ‘Jesus Returns: here he comes again’, is also out now: https://tinyurl.com/yce6bvtg and you can read more about it here: https://tinyurl.com/ya4uqnec. Check out my other “Rambling” blogs posts for articles on being an indie author, comics, politics, and reviews of books and movies! Lastly, follow me on Twitter @onlyanatheist1. Cheers!